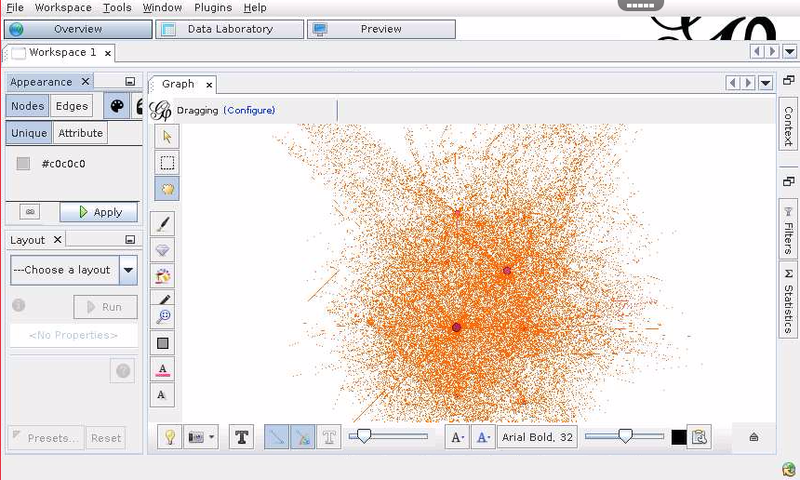 Visualization and exploration software for all kinds of graphs and networks. Profit from the fastest graph visualization engine to speed-up understanding and pattern discovery in large graphs. 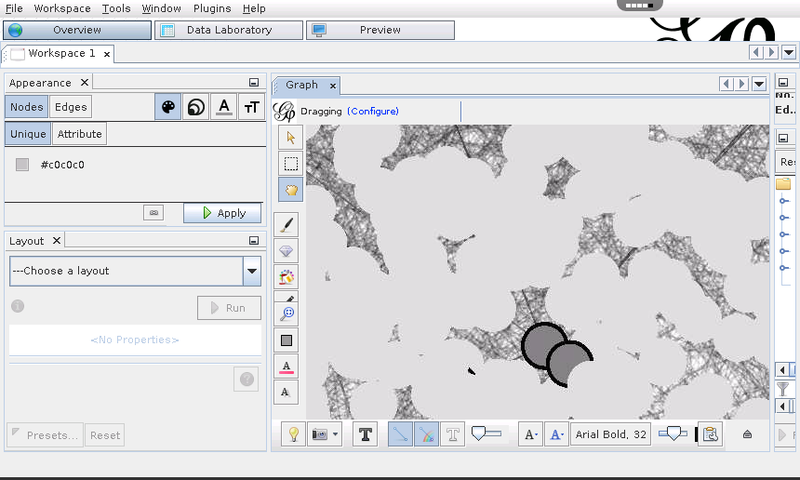 Powered by its ad-hoc OpenGL engine, Gephi is pushing the envelope on how interactive and efficient network exploration can be. Layout algorithms give the shape to the graph. 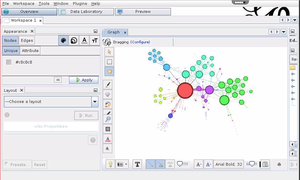 Gephi provides state-of-the-art algorithms layout algorithms, both for efficiency and quality. The Layout palette allows user to change layout settings while running, and therefore dramatically increase user feedback and experience. The statistics and metrics framework offer the most common metrics for social network analysis (SNA) and scale-free networks. 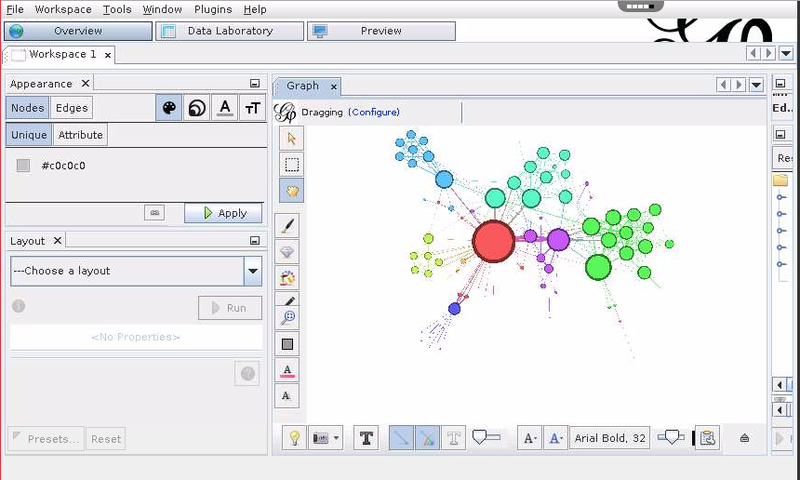 Gephi is a the forefront of innovation with dynamic graph analysis. Users can visualize how a network evolve over time by manipulating the embedded timeline. Use ranking or partition data to make meaningful the network representation. Customize colors, size or labels to bring sense to the network representation. The vectorial preview module lets you put the final touch and care about aesthetics before explorting in SVG or PDF. Filter the network to select nodes and/or edges based on the network structure or data. Use interactive user interface to filter the network in real-time. 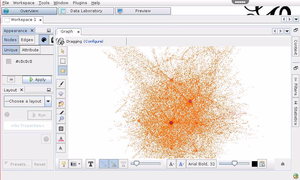 Gephi has its own Data Laboratory with an Excel-like interface to manipulate data columns, search and transform the data. Gephi can read the majority of graph file formats but also supports CSV and relational databases import. The built-in Plugins Center automatically gets the list of plugins available from the Gephi Plugin portal and takes care of all software updates. 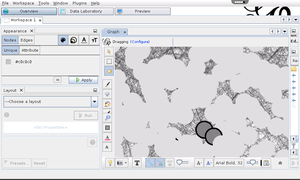 There are dozens of community-built plugins that extends Gephi's functionalities.